Wood decks are one of the easiest home handyman projects. The following wood deck plans make deck building easy. Always read the deck plans carefully and make sure that there is enough information provided for you to be able to complete the project - before you invest in materials. Some of the plans are excellent, giving a great deal of instruction in text, pictures and drawings while other plans are only drawings and still others are only sketches. Additional information on deck construction. These free deck plans are for the novice to intermediate handyman or woodworker. 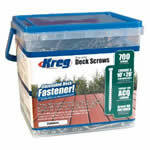 Selection of deck fasteners and hardware . These deck plans include benches and railings. These deck plans are designed for a ground level deck.